Plastic welding is the most common application of ultrasonic assembly. 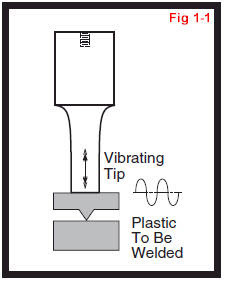 To perform ultrasonic plastic welding, a vibrating tip is brought into contact with one of the work pieces as shown in Figure 1–1. Pressure is applied and ultrasonic energy travels through the material, increasing the kinetic energy (or heat) at the contact point of the two parts. The heat melts a molded ridge of plastic on one of the pieces and the molten material flows between the two surfaces. When the vibration stops, the material solidifies forming a permanent bond. A housing which contains the transducer which converts electrical energy into mechanical vibrations. A horn to transfer the mechanical vibrations from the transducer to the parts to be welded. 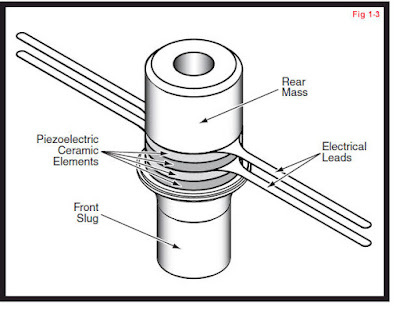 A basic ultrasonic probe is shown in Figure 1–2. 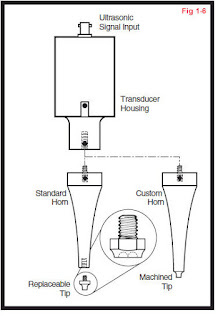 As indicated, the horn is secured to the transducer with a threaded stud. The transducer housing also has a connector for attaching the high voltage coaxial cable which delivers the high–frequency electrical signal for exciting the transducer. This signal is supplied by a separate ultrasonic generator. The transducer supplies the ultrasonic vibrations by means of piezoelectric converters which transform electrical energy into mechanical movement. Power applied to the transducer at 20kHz can range from less than 50 Watts up to 3000 Watts. The transducer is made from a number of polycrystalline ceramic elements separated by thin metal plates, clamped together under high pressure. When an alternating voltage (dV/dt) is applied to the converters (or ceramics), a corresponding electric field (dE/dt) is produced which results in a variation in thickness (dL/dt) of the ceramic elements. This variation in thickness induces a pressure wave (dP/dt). Because the molecules or atoms of a solid are elastically bound to one another, the pressure wave results in a wave propagating through the material which is reflected by the ends the metal mass of the converter. See Figure 1–8 for a graphical representation of this. When the length of the assembly is tuned to its frequency of excitation, it resonates and becomes a source of standing waves. 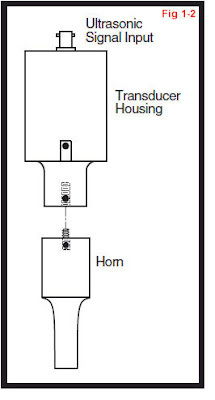 A typical transducer without its housing is shown in Figure 1–3. The output amplitude from a 20kHz transducer is only about 20 microns (0.0008 inches), so this amplitude needs to be amplified by the horn (and possibly a booster) to do useful work. It transfers the ultrasonic mechanical vibrational energy (originating at the transducer) to the plastic parts through direct physical contact, and localizes the energy in the area where the melt is to occur. It amplifies the vibrational amplitude to provide the desired tip amplitude for the thermoplastic and weld process requirements. It applies the pressure necessary to form the weld once the joint surfaces are melted. The ultrasonic horn is precision machined and designed to vibrate at either 15kHz, 20kHz, 30kHz, 40kHz, 50kHz or 70kHz. Figure 1–4 shows five aluminum alloy horns ranging from 15kHz to 50kHz. The higher the frequency, the shorter the acoustic wavelength, and consequently the smaller the horn. Notice that the 30Khz horn is only half the length of the 15kHz horn. The tuning of an ultrasonic horn is accomplished using electronic frequency measurement. Inherent variations in material composition prevent tuning by dimensional machining alone. Horns are usually manufactured from high–strength aluminum alloys or titanium. Both metals have excellent acoustical properties to transmit the ultrasonic energy with very little attenuation. 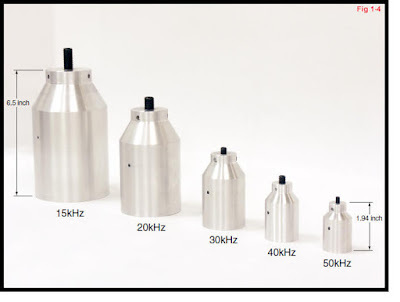 There are many different ultrasonic horn shapes and styles depending upon the process requirements. Factors which influence the horn design are the materials to be welded and the method of assembly. The gain of the ultrasonic horn is determined by its profile. 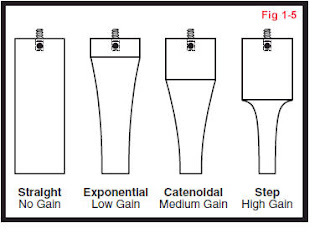 Figure 1–5 shows four different gain profiles. The input vibration amplitude to a horn from a 20kHz transducer is only about 20 microns. This is not enough to generate enough friction to achieve a melt temperature for most thermoplastics. Therefore the horn must amplify the mechanical vibration so that the amplitude is sufficient to melt the thermoplastic. The amplitude at the tip of the horn typically ranges from 30 to 125 microns (1.2 to 5.0 thousandths of an inch) at 20kHz. An optional threaded tip can also be used when the application calls for staking, a swagging profile or a pointed spot weld. In Figure 1–1, one of the plastic parts had a small ridge used to initiate the melt process. Here in Figure 1–6, the tip provides the energy director since there is only one piece to be melted in a staking operation. Replaceable tips are not commonly used in high–volume production environments. For long–term or high–wear production, a horn with a custom machined tip coated with chrome, carbide or titanium nitride will provide excellent wear resistance. As the frequency increases, vibration amplitude typically decreases. Higher frequencies are used for seaming of thin materials and delicate parts that do not require a lot of amplitude. Since the horns become smaller at higher frequencies, closer spacing can also be achieved. Some factors to consider for high–frequency (e.g. 40kHz) ultrasonic welding versus lower–frequency (e.g. 20kHz) ultrasonic welding are listed here. Wear on the horn is greater at high frequencies. Clean and flat mating surfaces between the horn, booster and transducer are more critical as the frequency increases. At 40kHz, surface flatness specifications are between 0.0005″ and 0.001″ (13 to 25 microns). The primary function of a booster is to alter the gain (i.e. output amplitude) of the probe. A booster is amplifying if its gain is greater than one and reducing if its gain is less than one. Gains at 20kHz typically range from less than one–half to about three. 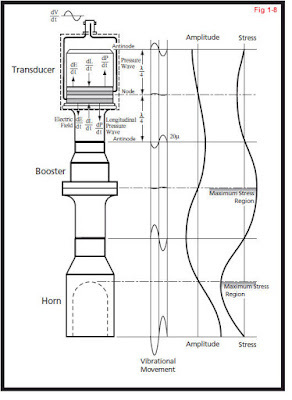 A booster designed to be mounted in a fixture between the transducer and horn is shown in Figure 1–7. This is commonly referred to as a probe stack. Since the horn cannot be clamped, only the transducer and booster can be secured. Therefore a secondary function (and sometimes sole purpose) of a booster is to provide an additional mounting location without altering the gain when the probe stack is secured in a press. The neutral (1:1) or coupling booster is added between the transducer and horn and mounted in the press by its mounting ring which is placed at the nodal point (where the standing wave has minimal amplitude). See Figure 1–8 for a graphical representation. Note that the maximum stress occurs at the nodal points.